Packed full of mischief, mayhem and fun, Beano is the world's longest running comic. Every week we break a world record! How cool is that?! 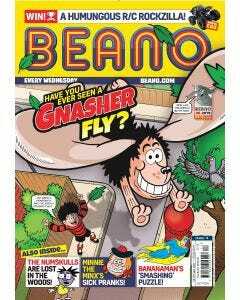 Subscribe to Beano and you'll save money, and receive it before it’s even made it to the shops. Keep up-to-date with the antics of the legendary Bash Street Kids, Minnie the Minx and, of course, Dennis and Gnasher. Already subscribed or not quite for you? Don't forget you can gift a subscription to another household.